Looking for premier King Salmon fishing in Alaska? The Alaska Sportsman’s Lodges located on the ba nks of the Naknek and Kvichak rivers are the perfect sport-fishing destinations for you. We guarantee that you will have the experience of a lifetime under the care and professional instruction of our world-class fishing guides. Our lodges offer 5-star services that make any visit more than just a fishing trip. Under our pampering care, we guarantee that you will be able to relax and enjoy a rejuvenating and exciting wilderness adventure. Alaskan King Salmon fishing is like no other, and we strive to make sure you have the time of your life while you vacation with us. We take salmon fishing in Alaska seriously; just as serious as we are about making sure your entire trip from landing in Alaska to your departure is an experience you will never forget. We have a lodge that towers above the banks of the rushing waters of the Naknek River and is nestled only yards away from the most lucrative fishing locations in Alaska. Unlike other fishing lodges that are located miles from the nearest fishing areas, the location of this rustic but luxurious getaway destination allows our guests to simply step off the front porch to reach premier spots for King Salmon fishing in Alaska. Our guests also have the rare experience of fishing in remote solitude as opposed to the type of combat fishing that is so typical of other Alaska fishing areas. This 5 star luxury lodge offers a fishing experience that typifies the remote and rugged beauty of the Alaska wilderness. Alaska Sportsman’s Lodges is also proud to invite our valued guests to come stay at our mountain mansion located on the banks of the famous Kvichak River. These crystal clear waters are pure, pristine, and overflowing with the type of trophy fish that legends are made of. This river is world-renowned for annual salmon runs that averages in the millions each year. 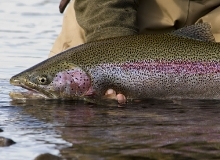 This region is known to be the most lucrative place for King Salmon fishing in Alaska. We are more than just fishing, as we ensure more than just big fish and great photos; we guarantee a relaxing adventure in the midst of our 5-star luxury services and amenities and there is always a chance to see some of the world renowned Alaskan wildlife. Come to the heart of the Alaska wilderness and let us pamper you at either of our luxury fishing lodges. Live every sportsman’s dream and catch trophy fish by day and soak up the comforts of our lodges by night. Sit back with a cocktail, cold beer, or soothing glass of wine while you relive and swap the fish tales that were created during the day’s adventures. Call today to reserve your dream vacation!